Dressing well is as much about propriety as it is about style, quality or personality. This is particularly true at work, where there are often prescriptions, or at least expectations, about professionalism and clothing. I have often talked over the years about sliding scales of formality – about how formal certain shoe styles are compared to each other, or ties, shirts etc. In this post, I wanted to set out a sliding scale for whole outfits. In the ensembles below, I have changed one thing each time in order to make it more formal. So we start with something very casual, and with each new piece, become gradually smarter. The different combinations are suitable to different work environments – or to different occasions. One for a normal work day; another for casual Friday; perhaps a last for the weekend. With each swap, the propriety changes. The same outfit with a shirt rather than a T-shirt, or jacket rather than knitwear, transforms when and where it can be worn. Small changes make a big difference. These are all things that I have written about in the past on Permanent Style (at those links above) but I don’t think readers have ever seen me in such a casual combination. It’s what I often wear at home. Given the slight dressiness added by the shawl collar around the neck, and the sparkling-white Common Projects, this is an outfit I can see friends in creative industries wearing. When everyone else is in T-shirts and jeans, this is not too smart yet clearly implies extra style and presence. These first three elements – shirt, shoes and trousers – could have been swapped in any order. Flannels would have been an interesting look with the trainers, and these slip-ons could easily have come afterwards. But I feel these are the steps most men are likely to dress up in, particularly given the popularity of jeans. 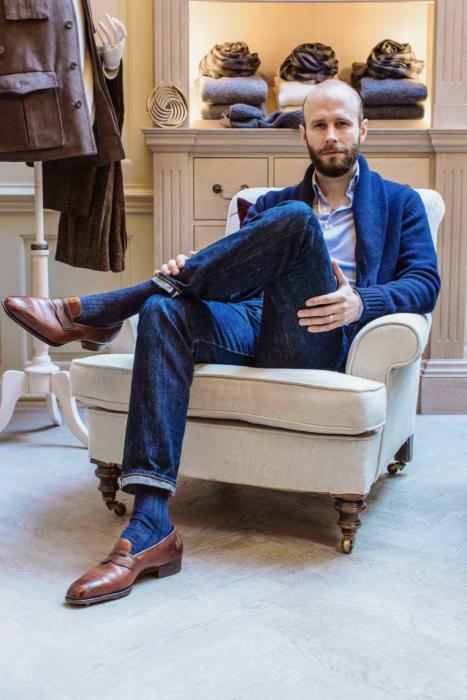 The bespoke hatchgrain slip-ons from Gaziano & Girling work with denim because of their colour (mid-brown), their style (loafer) and to a certain extent their casual texture. 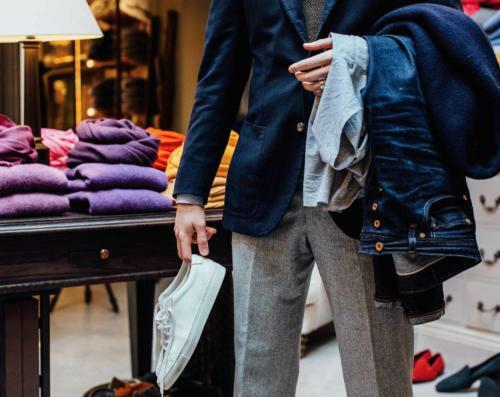 Swapping jeans for flannels (bespoke, Anderson & Sheppard) is perhaps the biggest change in this step-by-step process. Jeans will never be appropriate in many offices, but once you’re in a shirt and trousers, this could even be worn in a law firm on a casual day. Certainly, when men tell me they don’t know what to wear once they get rid of a suit, I would point them in the direction of this outfit and the next one: clearly smart, clearly well put together, but with none of the formality of a traditional, worsted suit. The sports-jacket-and-odd-trouser outfit is perhaps the office attire of the future. It’s certainly something that could save tailoring as more and more people abandon the suit. This combination is the simplest, easiest and most classic: navy jacket (bespoke, Solito), grey flannel trousers and a blue button-down shirt. 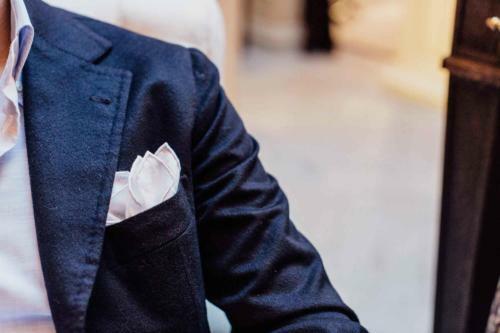 The handkerchief will be too dandyish for many offices, but even if you remove it, you’re a hell of a lot more interesting than the guy in a suit and no tie. And this can be livened up with knitwear etc more easily too. A brown knitted-silk tie finishes off the outfit. 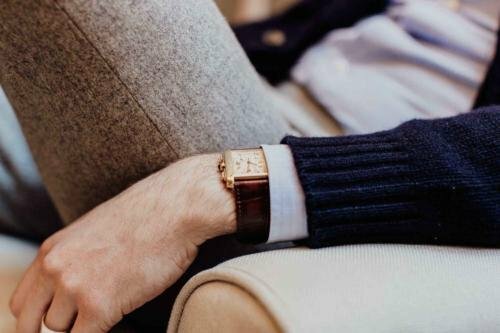 Ties that are more casual – knits, wools, wovens – are easiest to wear with sports jackets, and a knitted silk sits bang in the middle of that range. A black knit-silk and darker brown shoes would be a step more formal. With that finishing touch, we’ve run the gamut from slouch to sartorial; with every stage in between. And again, if you remove the handkerchief this wouldn’t be too dandyish for many offices. So which would you wear, and when? You can follow the discussion on Which office are you? (Or, a sliding scale of formality) by entering your email address in the box below. You will then receive an email every time a new comment is added. These will also contain a link to a page where you can stop the alerts, and remove all of your related data from the site. Brilliant. These are the posts I love the most – very accessible for all. Thank you! Sadly I have to wear a formal suit everyday! Usually somewhere in the neighborhood of #6 with a necktie (I enjoy these), and sometimes even suit (double breasted and a flannel three-piece during the colder months). None of this is required of course (I teach at a large university), but I enjoy dressing reasonably well, and it helps put me in the right frame of mind. And who knows? A few more students might be a bit more inclooned to take what I tell them seriously. Maybe. I, too, am a university professor like Heinz-Ulrich von B. The sport-jacket and odd-trouser combination is my everyday outfit, even though less than half of the male faculty abide by it. I try to live by the “look good, feel good” motto, however, and a few (very few) of my students have started expressing an interest in wearing something other than jeans, t-shirts and cargo pants. And yes, I ALWAYS wear a tie. This post is very good for forwarding to friends, which are not yet hooked up by style awareness. Love it! Thanks. I basically wear each of these outfits from monday to sunday. Outfit 5+6: Normal days at the office. Tie deppendig on mood and maybe what kind of client I’ll see that day. great article. Did nearly fall of my chair a bit seeing you in a t-shirt however. It is surprising how many people believe that to make your work attire more casual you just put a full suit on, formal shoes and remove your tie! A few more posts like this showing casual outfits would always be welcome, not just for the workplace. Pubs, Restaurants, Holidays etc. I’d love to see casual outfits for summer time also, and for times when inclement weather in the British Isles forces one to wear outerwear while being too warm for knitwear underneath. Sadly I don’t get to wear a formal suit everyday. Most excellent. Please oh please Simon might you do an article on heat at home and on holiday? It’s starting to get to that time when things are thawing in parts of Europe and we need to be prepared ! Is it possible to wear shorts and shoes? Socks? Good materials, how to cope with sweat and sun? So many questions! Though flying to New York this afternoon where there’s a high of 2 degrees! Doesn’t feel very summery…. Sadly the standard of dress in my office is so low that pretty much anything which isn’t a shiny black / grey / navy suit from Marks & Spencer, or an open-neck shirt with a grey / navy jumper worn over the top is likely to stick out like a sore thumb. Oh dear. Does outfit number one work at all, outside of the summer? There are a few of us in the office who dress at the outfit 2 and 3 levels and I often hit 4 (then again I’m a director). Your outfit number 1 is way above the office standard in terms of quality. Shoes seem to be a particular problem for a lot of men. Apologies for going off-topic here – just wondering what your experience of the green loden SB coat has been? Does the colour really work with a suit? Love this post. I get the point that with many of your outfit posts you’re trying to “push the limits” of combinations but it’s really helpful to see some more classic outfits showing how a few basic items can be combined in different ways. I guess the fact that many of these items work across outfits of different levels of formality shows why they’re classics. The pale blue BD shirt seems to be notably versatile, spanning the range from #2-6. Does Luca make your short sleeve polos, too, or do you wear OB short sleeve polos? I’m an attorney for a law firm in Baltimore, and I’ve settled on the sport-jacket and odd-trouser combination at this juncture. More often than not, I also wear a tie. But, I distinctly remember the managing partner coming by my office to welcome me during my first week and he remarked on the fact that I was “still” wearing a tie. With but a few words, he had indicated the level of formality the office typically abides by. I do not believe I agreed considering that we are lawyers…. How can grey clash? Never mind. Thanks. Clash perhaps wasn’t the right word but my wife to be has suggested that navy would probably look better next to her white dress. Best to follow instructions! Fantastic article Simon! It’s amazing to see how each alteration kicks it up a notch. Also nice to see you in some more casual outfits. Would love to read more about how you incorporate sartorial clothing into your weekend attire. Nice series, very real-life. What’s your take on contrasting vs. matching socks, and their roles in the spectrum shown here? You went for blue with jeans and grey with flannels. Do you ever go for purple (green, burgundy, pink, … ), and when? Thanks. Hi Simon, great piece. The thing that struck me most is the comment that a simple white hank might be too “dandyish” for many/most workplaces. Is the implied suggestion that gents should/might discard this aspect of the outfit in some offices for fear of alienating themselves or creating the wrong impression? I certainly hope not! 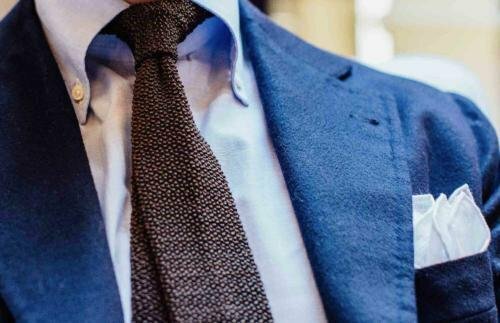 Anyone know where one might source a bespoke knitted tie? My body is too long to make do with OTR. This is one of my favourite posts and will no doubt be referring to it in the future for inspiration. 4,5 and 6 will be fine where I work and tried a similar look to 6 about two weeks ago (but without the square and with a cashmere tie from Drakes). Loved it but ended up getting asked if I made the tie out of tracksuit bottoms. Sigh. Such a beautiful jacket, thinking it’s the cashmere Solito jacket you wore in your scarf tutorial video. But I noticed a lot of your sports jackets fit a certain way, do you like them cut slimmer than your suits? Compared to your chest and waist measurements how much extra room do you prefer for your sports jackets to be cut with? Thanks Simon! More of these please! I think they are of practical interest to most readers – even those without the budget to invest in some of the other pieces you have profiled. How the heck do you do that? Very stylish no matter what the occasion. I’ll have to keep signing in to keep up. what is it about Sunspel t-shirts that you like? I’ve tried a few and found the cut uber strange, especially around the armpit area. JS is better, although nothing special when it comes to the material itself (this goes across the whole range of garments from JS in all honesty). Not crazy about loafers with jeans, especially when the loafers are based on a longish last like on the photos, then again I generally dislike non-laced shoes, so that might affecting my judgment. As for office areas, try the above in an engineering office (heavy industries, not software). One last thing, is keeping the second button on a shirt unbuttoned a British thing? never seen so many men doing this, apart from perhaps warmer countries like Spain or Italy (and it’s not a majority of men anyway from what I’ve seen so far). I never unbutton the second button in an office, no matter how hot it gets in my New York office in winter! It just seems wrong in a business context to show chest, particularly chest hair. Not convinced those loafers go with the jeans. They seem too formal for jeans. Perhaps suede loafers would have been better? 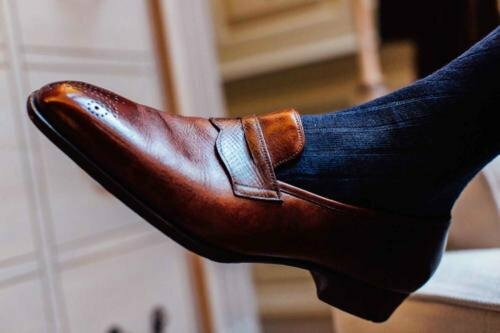 looking at those loafers I think it would be great to have an update on some of your bespoke items on how they are ageing. I was in 2 minds about the colour of these loafers in previous posts but you can see they are developing wonderfully. So much I am thinking a hatch loafer could be my next shoe.. because I actually think they go really well with the jeans. Excellent post Simon. I’ve always been a fan of these “guide” format posts, and it is always interesting to see how others work more formal pieces into casual ensembles. great post. What’s your view on button-down-collar shirts with ties? Clearly, you approve in this post. Generally, in a business context I hate to see a tie and button-down shirt (a button down shirts I associate with more casual looks). As a rule I’ve never combined the two but admit it does look great in your post (I have a very similar-looking Emmett shirt and brown square end knitted tie again from Emmett). Many thanks, Rich. I really like the proportions and roll of that shirt collar. It’s something that seems to be near impossible to find of R2W button downs in England, with most Jermyn shirt-makers seemingly favouring mean, shrunken little collars that produce no roll and can’t be worn properly with a tie. Can you recommend any UK-based retailers that offer Ivy-style OCBDs with a decent unlined collar? I’ve been looking at Drakes but it’s hard to gauge the quality of their shirts from the pictures on their website. Otherwise I might consider a US-based retailer if you can recommend one. If you want the real deal on OCBD with the button down, try Mercer in the US. What an informative post. Thanks, Simon. A question about the jeans and sweater combination: how much contrast is there between the color of the jeans and the color of the sweater in real life? 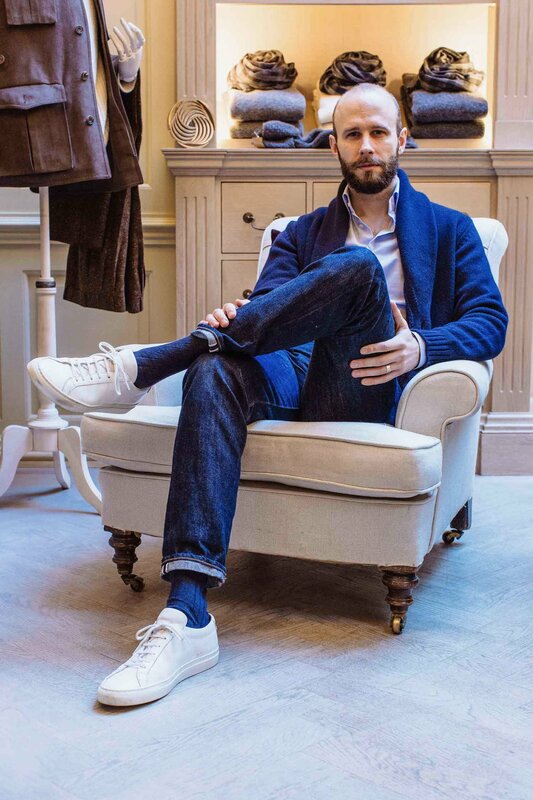 I have a similar navy shawl collar sweater (albeit not a cardigan) and when I wear it with jeans I sometimes feel like I’m wearing too much blue. Perhaps leaving your cardigan open allows a glimpse of your contrasting shirt to break things up? Yes, though you do need some contrast and this is helped by bluer or more heavily worn jeans. Ultra-casual (according to PS) is how I come into the office now most of the time just out of spite, although I tend to add some Edward Green’s. Most coworkers (->law) are suit-only, although said suits appear to be made from the same material used for vinyl but spun into some ungodly thread. Also they colormatch ties and hanks. Also they tie their ties with windsor-knots, an especially disgusting misbehaviour and a pet-peeve of mine. I think as a next step I will get a full beard. How do you get creases to hold in your flannels? Even after pressing my VBC flannels lose their crease after about two wears. Italian flannels will generally be worse than English, and lighter rather than heavier. What kind of socks (brand and material) are you wearing with your jeans and your flannels? Those loafers really do look dressy. Hi Simon – What is the leg opening of your jeans? I find that most of my jeans look a bit off with common projects because the leg opening and the sleekness of the shoe are out of proportion. Also, what material is that Solito jacket? I sort of agree on those trainers; I’m sure yours are nothing short of superlative in every aspect, but I’ve just seen some on a market that aren’t visually different for £5.99! That’s a great look though, and scrolling down this post was an absolute joy. What’s your view on tasseled loafers with jeans and chinos? I’ve always thought the tasseled loafer better suited to more formal trousers. My office is quite casual but I wear variations on number 6 most days. I wear a suit maybe once a week. Just often enough that I no longer get asked if I am going to job interview. Numbers 4 and 5 for casual Friday. Does the formality change in the summer for you Simon? It certainly does in my office. As always you have terrific articles dealing with men’s style. I was sorry that you didn’t mention socks. 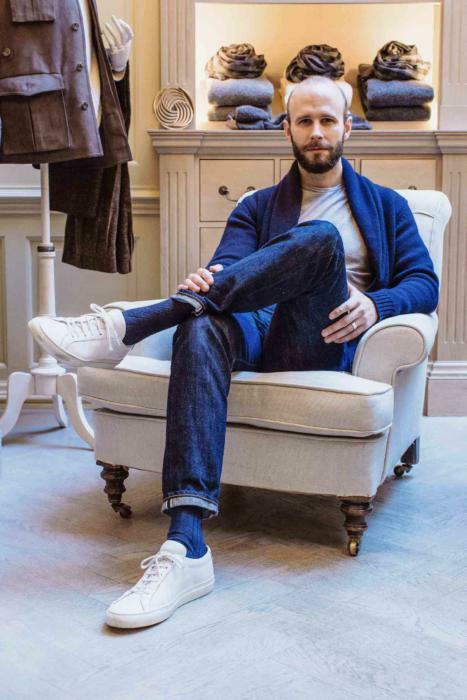 When a man sits cross legged, his shoes and socks are prominent to those viewing. In your photos, your socks were changed each time you varied your pants. Hello Simon, great article! My one question is regarding shoes – would a double monk shoe fit to the latter two styles (with the jacket)? Im am yet to fully understand, where double monks stand in terms of formality. 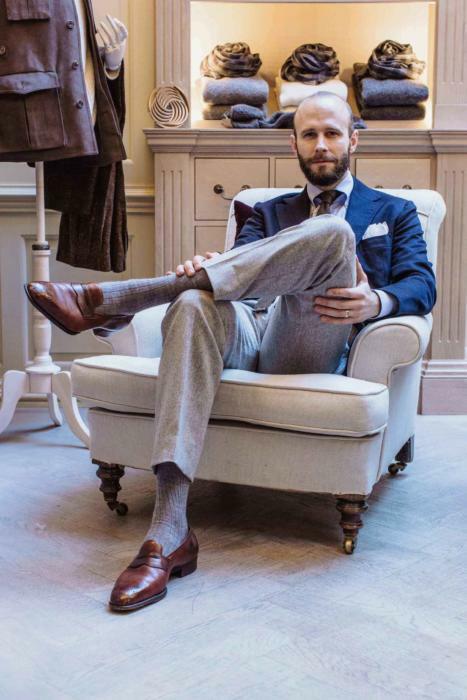 Justin, FWIW I find double monks very versatile as a nice middle ground that can be worn with flannels, chinos or jeans – I think of them in a similar way to chukkas. Probably a bit too casual for a suit (except maybe a Neapolitan style) but good with most other options. On the note of trouser crease where do you stand with trouser presses? I was always curious if the continuous pressure and heat could damage any fabrics? Great post Simon, top 10 for me for sure, hope to bump into you in March in A&S! 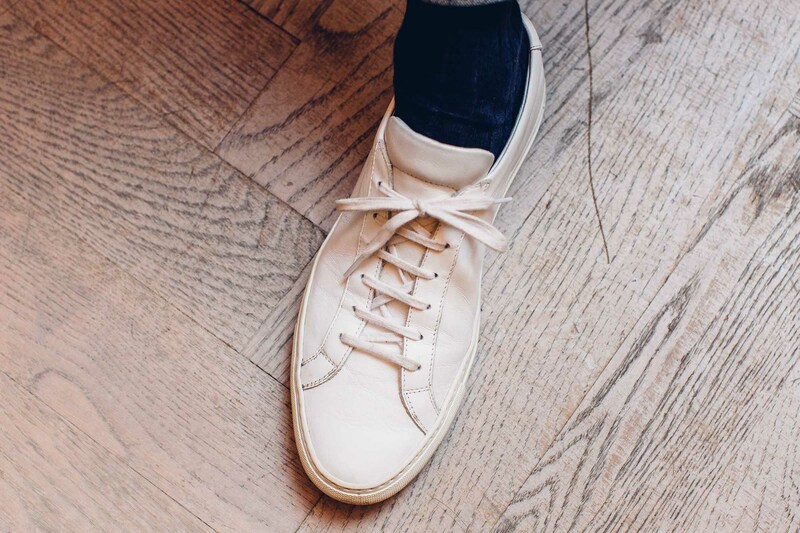 You very often feature fantastically high quality brands, and I’ve thoroughly enjoyed some of these brands (especially albam), but they do tend to be towards the pricier side. With this in mind, what cheaper brands would you recommend? I’d especially love to find some wool trousers (~£100), Knitwear (~£150), and socks(~£10). I generally write about quality, Gus, and frankly once you get to those price levels the quality is very similar across brands – and frankly there isn’t much to write about. Also, to cover that kind of area well, you need to have an awareness of a much broader spread of brands (100s of them) and update it all the time. Because cheaper brands go in and out of business, the bigger ones change their factories every few years, and everyone changes their style and cut every six months. So it’s almost impossible to give a comprehensive recommendation. Simon has reviewed Viccel, a sock brand, favourably. Their socks fall into you suggested price range. I recently ordered some socks from them and am happy with them. For knitwear you might try Ralph Lauren. Trousers, maybe Howard Yount (a US brand). The trousers would be an online buy which might be tricky for getting the right fit. I saw Viccel on this site as well. I think I’ll give them a try. Howard Yount looks Fantastic! They provide detailed measurements on their website so I’ll compare those with a well fitting pair I already have. Do have experiences with Yount’s shirts or knitwear? Also, when you say Ralph Lauren, which Ralph Lauren Brand do you mean? I had a nasty experience with Polo’s quality when I was younger and haven’t tried a RL product since. I’m Canadian and due to our horrible current exchange rate haven’t tried Howard Yount yet. They get very favourable reviews as far as I know. I was thinking Polo Ralph Lauren as it is in your suggested price range. Ralph Lauren Black Label is better quality but you might need a sale to find it in your range. TM Lewin or Charles Tyrwhitt might be another decent source for knitwear. I’ve also looked Woolovers, which are very well priced but seem to be rather generously sized and I suspect they wouldn’t fit my slender frame very well. I don’t know if you revisit the comments Gus but eBay can be a good source of knitwear. I purchased a new navy knit waistcoat there at a very good price. And John Smedley operates an online outlet with very good prices on really nice knitwear. It often features some rather odd (to my eyes) colours and larger sizes but I am watching it patiently for things I would buy. On the Solito jacket – what colour are the buttons? Informative post. Always a pleasure reading your blog, gives me plenty to think about. What’s your view on navy brushed flannel trousers as a standalone pair of trousers? Ie not part of a suit. Could they be worn in place of the grey flannel trousers? Obviously, the other items would have to be of a different colour. Love the Solito jacket. Just curious, do you think navy fresco would be an acceptable material for an odd jacket? Or would it look too much like an orphaned suit jacket? I love the way the cashmere looks but it gets so hot in the summer here in NYC and I really need something a bit smarter than the tan cotton staple. Simon have you ever played with, or thought about, raw silk for a jacket? Not raw silk, no, but it can be nice as a dressy option. Brilliant article Simon and so interesting. I do believe that jeans and indeed T-shirts are a no-go for anyone over 25. They are the demise of civilized society regardless of their cost and who made them and personally, i believe point towards a lazy choice. Yes! I completely agree with knitted ties. I own a few, they’re great in theory but I’ve never seen them carried off in practise. Even on the Viola Milano website- and those lads can carry things off. As for the outfits in the article, the individual articles seem nice enough, but it’s all a bit dull. You might as well wear a suit. In the first with the jean t shirt etc. Everything’s blue and grey, there’s no pop or flair, why not try some cords to add a bit of textural variation- or something from the other side of the colour wheel- a burnt orange v neck under the cardigan? Same goes for the other outfits- everything is a neutral shade and the same texture. Nice clothes individually but crying out for some imagination concerning variation or colour somewhere. Thanks John. Part of the point is the clothes are simple and monochrome, firstly because these are the easiest to combine in lots of different permutations, and second because we are demonstrating how quite sartorial clothes can be suited to any office environment. Very enjoyable post. Would love to see a summer version for the warmer weather. I’d second that idea Simon. From the amount of comment generated this must be one of your most popular posts. Fantastic Post! Thank you Simon. Unfortunately I work in the financial sector and I wear a suit everyday! Great item (thanks) but what interested me were the large number of replies and what most people are saying they wear at work. In my industry (software) the norm is about minus 3 on your scale – anybody with clean trainers or a t-shirt that does not have a Star Wars character is unusual! I tend to go with number 3 but it would be impossible to go beyond number 4. Love it. I’m posing with my jacket flung over my shoulder next time! What kind of outerwear would you recommend with look 4, perhaps a harrington or field jacket? I always find it hard to match casual non-tailored jackets with proper trousers so I usually opt for chinos instead. I’ve a pair of black chinos (impulse buy!) that I’m trying to pair with a suitable pair of shoes. I’m thinking a pair of black penny loafers. Ideally, I’d have gone with a suede pair or a pebble grain variant. However, these are not readily available. I could them MTO but I’d rather explore other options.Would you say I could get away with a standard calf skin pair? Or perhaps a cordovan pair? Yes, standard calf should be fine. Black is not easy though – you’re pretty much limited to black shoes! Thanks for the advice. Was hoping the smooth calf would be OK. It was a case of I liked the fit in one colour and then bought several pairs in other colours…….including black. However, once I got to thinking about how to wear the black ones, I realised it was a bit of a silly buy! Still, I’m going to wear them with a John smedley charcoal long sleeve polo, so hopefully should be ok. I took your advice and visited the Haberdashery back in December, I walked out of there with the shawl-collar cardigan and it’s terrific. I absolutely adored their shop and the lovely service I received from Emily was one of a kind. Will definitely visit there everytime I go to London. Thanks for an outstanding blog. This is excellent. Such a useful reference point and spells out the logical thought process one already has in the back of one’s mind. Have you done a post on the G&G loafers? I searched but couldn’t see one. I see they are bespoke but are they based on a standard style? They seem an almost perfect bridge on level of formality (wholecut, but with lighter colour, hatchgrain etc). Sorry if you have already answered this, I skimmed the comments and couldn’t see a response. Hi Simon, I know you rarely wear RTW trousers, but is there a manufacturer you would recommend buying RTW flannel trousers from? Thank you. Not really Peter. It’s very hard, because to be able to recommend someone, you’d need to go through their full collection every year, they change so much. And they often change factories every 2-3 years, so the quality might also change. I just bought shoes similar to the G&G ones here but instead from Ralph Lauren by Edward Green. Though they have no strap and may be a tad lighter. I believe they may basically be the Bamford model by EG. Would you say they could be worn similarly or would they not be formal enough? Was wondering what size are you wearing for the A&S cardigan? I am around 1.83 cm and 70 kg. Please recommend a size. Thank you. If You should change the loafer for a “winter” version which type of shoe would You go for? I am thinking of a chukka in brown suede – could it work? Or? A chukka probably wouldn’t be smart enough, no. How about a split-toe derby in dark brown calf? Are you wearing two different button down shirts here? A chambray made by Luca and another one? Or is there only one? I think only one but not 100% sure. Yankee workaholic here from New York. I’m a former junior fashion designer turned corporate lawyer. I keep up with my love of classic clothing, always looking to acquire quality investment pieces that last. I don’t need much variety – I like the idea of a uniform. The advice you provide (in all media) is very helpful to me. Though I work in “big league” corporate law, my particular firm is most likely the worst dressed firm in New York. Lots of suits sans tie, for example. My Monday – Thursday uniform is a navy blazer or sport coat, classic shirt with some pattern, and grey trousers. I realize your advice of the usefulness of flannel trousers. My question is this: the flannels I have (all RL) are quite heavy — I imagine they are weightier than those you refer to in your writing. In New York, they work for October – March. I were to have pants made for me, can you suggest a weight (and perhaps a particular cloth) that would take more for a few months? Hi Simon, what’s the flannel pants’ fabric? Would You ever consider wearing a tie in picture 4? If so would it still be the same brown Silk knit tie? Simon, can I ask which make of socks you were wearing in post 3 ? as of late, I have been thinkg about trouser hems a lot and would like to ask your point of view regarding hems for (pale) grey flannel trousers (wintery cloth). Would it be something you would recommend? What would be the thinks i should definitely pay attention to before making the final decision whether or not to have hems on flannel trousers ? Thanks! Hi Justin, I assume you mean turn-ups, or cuffs, rather than hems? If so, the key thing is that turn-ups are less formal, and more suited to casual trousers or suits. After that it’s just a question of fashion – whether you like the style or not. Sorry, yes – tur-ups. Would that mean that flannels with turn-ups would be more a casual friday wear in an office, where most of the men wear suits or orther kind of business formal wear, rather than everyday wear? Thank you, Simon, for the very fast response and all the info! Have a great day! Hello Simon, sorry to bother you again, but i would like to ask, if you have any advice for cleaning light-grey flannel trousers? I have bought a pair and like them so much, that I have worn the for the last few days, just to better understand how they feel. The only downside is, that they have gotten dirty where the inner ankle bones are (i don’t know, if its from one leg rubbing against the other or the boot of the other leg). The label says dry-clean only. So should I just do that, and how often would be often enough? Or is there first aid solution after coming home from a walk? Any advice would be appreciated. thanks! Your shirt is great, where is the cloth from? Do you know when the cloth will be shipped? Luca is here in NYC at the back end of next week so I was hoping it would arrive before then and I could hand it to him. If not, perhaps I could adjust my shipping address to have it sent direct to him? A question about the tie! I’ ve got a dark brown knit tie for my birthday (chocolate). In what other combinations than the one you use it in (Blue jacket, Grey trousers) will a brown tie be udeful? I am thinking at light trousers (khaki) and ? Simon, this is a brilliant post. 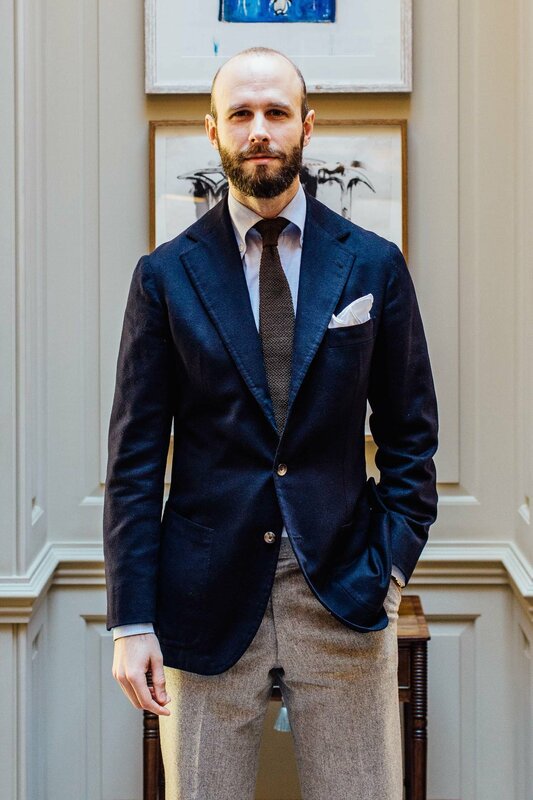 I am looking to commission two blue jackets, to wear as separates in an office environment – one two button and one DB if i am brave enough. I like the elongated soft Napolitan shoulder (slightly elongated if possible as i am quite thin). I like what Solito and Caliendo did for you. Do you jnow when they are next in London and can you share contact details? Is that a Cartier watch? Could you please let me know which model is it?….. I love the shape and the strap. I just did, but I still couldn’t find the watch you are wearing here in the picture under section (4) of the article. So my questions are these: 1) what is that stitch properly called? 2) is it just a running stitch? 3) can it be added to a finished garment for look? 1) It can be called a swelled edge, or just a run of pick stitching. 2) It’s not quite a running stitch as the stitches aren’t even.